Tomson Nguyen and Tracy Tran both have parents who worked in nail salons, but when coming up with the concept for GLO Nail Bar, they envisioned an experience that was nothing like the types of salons they spent their childhoods in. The couple realized there were many tweaks and upgrades that could be made to improve the quality of service. “What we wanted to do is like what chefs are doing with traditional recipes. Taking something good and putting a new twist on it,” says Nguyen. GLO is located in the center of Orange County in Costa Mesa. The area is known for its beach and boating scene, and GLO is not far from a freeway off-ramp, which makes it accessible to residents from all over the area. Despite the convenient location, Tran admits she is keeping her eyes peeled for properties out in Newport Beach, where many of her regulars live. Cran-Applecious, Vanilla Delight, and Bubbly Champagne and Roses sound like cocktail concoctions, but these are just a few of GLO’s long list of specialty pedicures. Customers can choose from 13 inventive treatments that are all made in-house. 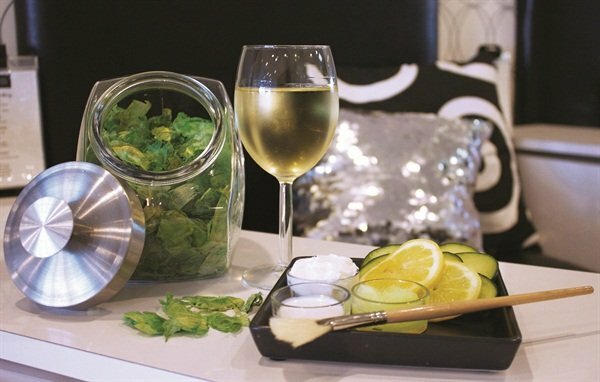 One of the most popular picks is the Mojito Pedicure. The service begins with a foot soak containing fresh mint leaves and essential oils that will tickle and elevate the senses. A mint exfoliating scrub is then applied to the feet and calves to get rid of dead skin. This is followed by a mint mask and a paraffin treatment. The Cucumber Sensation Pedicure is another popular pick. It combines an intensive callus treatment with the vitamin- and antioxidant-rich cooling and soothing quality of cucumbers. GLO’s prices range from $16 to $60. The classic manicure is $18. Although many of GLO’s clients request more conservative styles, GLO is building a reputation for its nail art. The salon’s Instagram feed shows off creative nail art from metallic gold tape and negative space patterns to jewelled embellishments. GLO is in the midst of a major expansion, and with more space comes the need for more staff. The salon opened in April 2014 with three employees and in less than a year has expanded the staff to 19. Within the next couple of months, GLO hopes to have a full staff of 25-30. GLO’s nail techs range in their levels of experience. The salon has staff that have been doing nails for years, and also hires techs fresh out of nail school. However, Tran is very selective on which nail techs are allowed to do specific services based on their level of expertise. Techs right out of school only work on basic manicures and pedicures. Only after they have become proficient with the process of applying gels and nail art are they allowed to provide these services to customers. Although technical skills are a necessity, Tran emphasizes the importance of her staff’s personality. “They have to be able to talk to their clients. It’s part of the service,” she says. Although Tran is busy running the salon, she still provides in-house training to hone their craftsmanship and nail art skills and encourages mentorship of junior techs by the senior staff members. The 1,000-sq.-ft. salon is narrow but efficiently laid out. 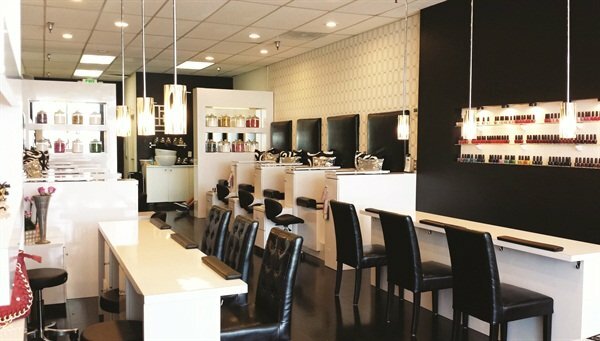 With the new space they are acquiring, the salon will double in size to 2,100 square feet. Tran has dabbled in interior design, and created her pedicure stations to function as storage space also. 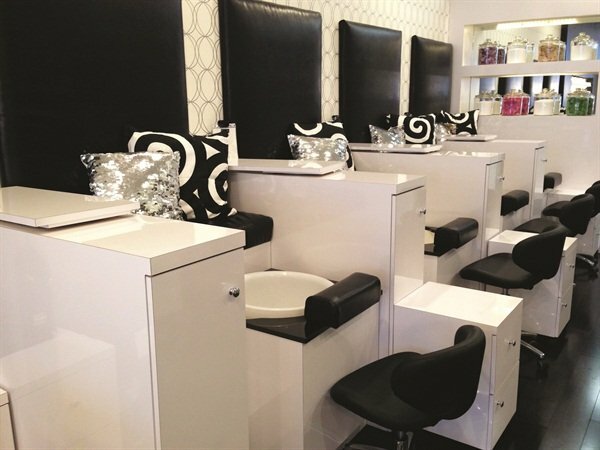 Each station allows for customers to get their manicures taken care of as they are getting their toes worked on, due to the swivel-top design of the chairs. 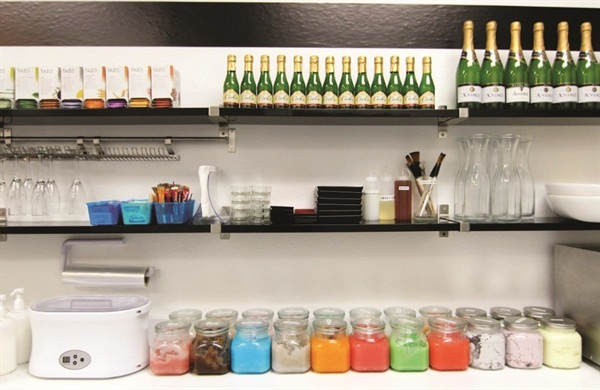 “I kind of took the idea of a Lazy Susan and tweaked it to fit a manicure station.” GLO’s decor plays with different wall patterns, but keeps a black-and-white color scheme to emphasize the wall of polish behind the nail bars. Nguyen and Tran have made it clear that GLO values the experience as a whole rather than just getting the customer in and out. GLO offers a weekly happy hour from 1 p.m.-4 p.m. on its manicures, pedicures, and specialty services. The salon also sells merchandise from a local jeweler. The Tanya Kara jewelry ranges from gold midi rings to chunky gold chain bracelets. GLO reflects the couple’s personal style: chic and young. GLO even sells the increasingly popular temporary Flash Tattoos. GLO has its fair share of regular customers. One can tell from the friendly conversations overheard in the salon that for many it isn’t their first time with that particular nail tech.